The toddler sewing pictures I promised will have to be put on hold a little longer, since the garments in question seem to be perpetually in the laundry. In the meantime, check out my new sweater! It’s a Central Park Hoodie. You’ve seen it before. In fact, you’ve probably knit one yourself. More than 1400 Ravelers have. 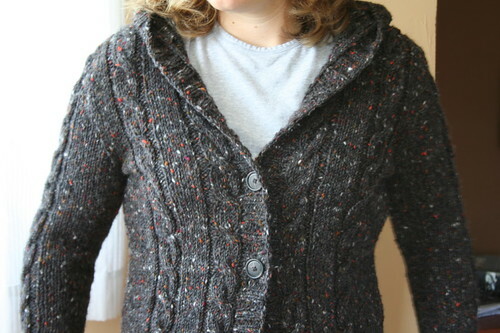 Modifications: I knit the 36″ size exactly from the pattern but I added two inches in length because I wanted to wear this as a coat. This is definitely an outerwear garment. 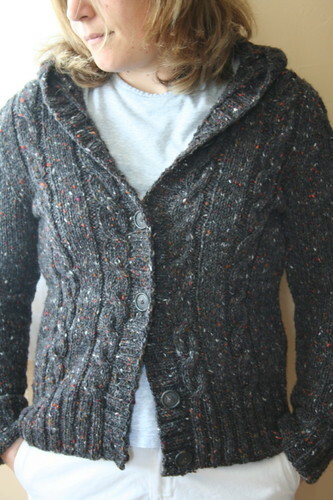 Tahki Donegal Tweed is every bit as hot as you would imagine. In spite of its warmth, I have little doubt my CPH will become my most worn hand knit garment. 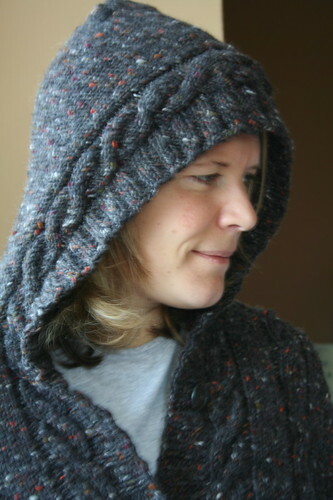 In fact, I’m contemplating a second CPH in something softer and more appropriate for indoor wear. You cannot possibly imagine how hot I was just taking these pictures. I could only keep it buttoned for a few minutes. Finishing a heavy wool sweater in 90 degree weather? Suboptimal. While I love the tweed I chose, I admit that I regretted not using my Skye Tweed stash having seen the CPH iSeL finished recently – I even have the same color stashed! But no, that particular yarn was already set aside to copycat Christy’s Tweedy Aran. A few weeks ago, I looked through some cable stitch books and swatched a cabled sweater for Aaron, what I’ve dubbed “Aaron’s Aran”. I initially intended to use Harrisville New England Highland but when Ram Wools had a sale on Selkirk, I bought it instead. Lots of it. 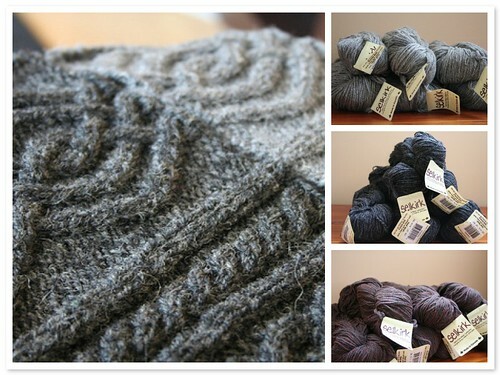 Even without the sale, Selkirk sells for $5.95 for 273 yds of worsted weight yarn. 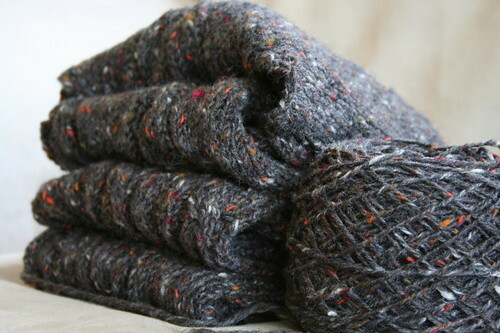 In fact, my Selkirk and Highland swatches feel the same and both knit up at exactly same gauge. And now for the big argument: what size to make? The knitter would prefer to finish in her lifetime and to fit his 35″ chest. The tall, skinny man who buys clothes far too large for him, would prefer the 44″ size. Where is the middle ground? What would you do? It’s been a busy few weeks here! 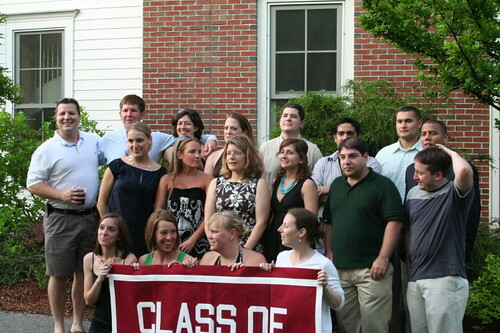 We just returned from a weekend trip to my 10 year high school reunion. I’m so annoyed with myself for forgetting my camera at virtually all of the events but I did manage to snap a few pictures. Only about a quarter of the class made it back but it wonderful to see those who came. We picked up right where we left off ten years ago as if nothing had changed. While our lives have changed radically, the personalities certainly have not! I think my class must have been a particularly good one because there is not one person with whom I would not enjoy spending time. That was certainly an interesting observation to come out of the weekend. I doubt many people could say that about their high school class. I think the reunion also gave Aaron some context for my stories, since it is often difficult for him to understand the boarding school setting. Oh and the other bonus? I ran a personal record in the annual 5K pie race – 26:57! The reunion provided my hands a much needed, 3-day break from knitting. I usually manage at least a few rows every day but it was too hot and sticky to even think about it. 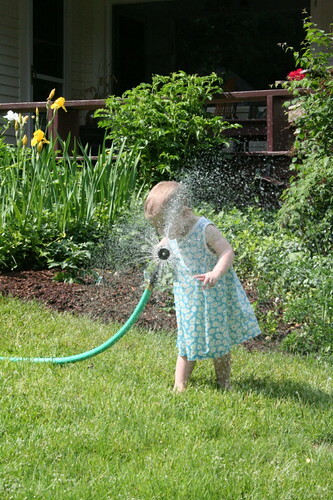 Instead, some of us played with the hose. So, a break from what knitting? Sweater knitting! Doesn’t everyone pick up a heavy wool sweater when the temperature climbs into the 90s? 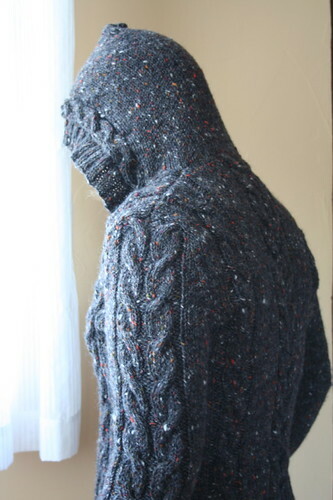 Here we have the back, fronts and one sleeve of a Central Park Hoodie, which I hastily cast on and furiously knit last week. The yarn is Tahki Donegal Tweed in “Obsidian” (#850) or, as I’d like to call it, “Only Photographable with a Tripod and ISO 100”. 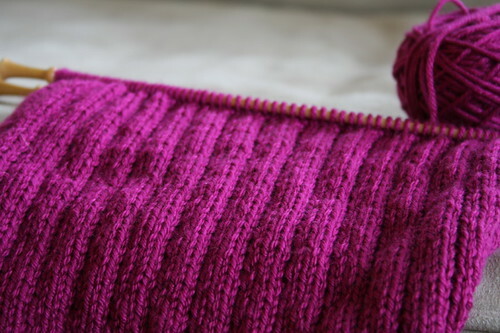 I am making the 36″ size (no ease) and when I knit and washed my first sleeve swatch, the gauge matched precisely. Perhaps a result of using the recommended yarn? Forgive my surprise, following patterns exactly is a new thing here at ExerciseBeforeKnitting. 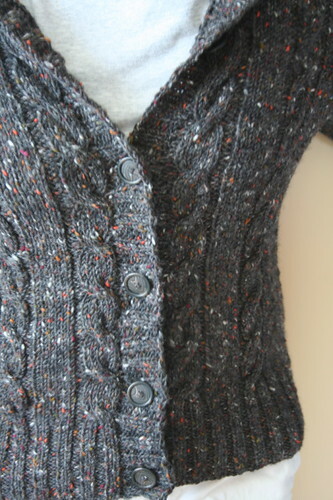 Knitters on Ravelry have commented that the cardigan fits snugly; however, the stretchiness of the yarn makes me wonder if the knitted fabric will sag and droop. Still, nearly 1400 knitters Ravelers can’t be wrong, can they? My fiendish sock knitting last month wore out my hands so I sought out some projects that could be knit on straight needles. I know many people curse straight needles but I confess that I love them. Brittany birch straights, in particular. Circular knitting always hurts my hands after a while but I could knit painlessly with straight needles forever. While they are impractical for a lot of my projects, I usually pick them up when I’m tired. This is the back of a sweater for Beatrix. Little Knits recently had a sale of 10-skein bags of Rowan Cashsoft DK in “Madame” for $25 and I bought one in spite of my current ban on pink and purple. A $25 Rowan sweater? What would you have done? Well, if you were smart, you would not have received ten skeins of bright pink, notoriously pilly yarn in the mail. In fairness, I did not expect it to be quite so bright. I suppose I will use it for baby and toddler knits now. I think an adult sweater with this yarn would be too garish to wear. I hope you all had a great weekend! Expect some more sewing from me later this week!